The cricket mkts (non IPL), have become incredibly gappy. I imagine this is an impossible task, but, is thre any way to protect users, from taking red/green, when the spread between bid/ask, is say, over 15 ticks ? I have enabled the new 'greening formula', but, havent really noticed any change yet .. but, its early days. An easy way to do that would be to implement a threshold on the over/underround, it's what I use when entering a potential gappy market. I understand u can build that rule into guardian, but, didn't think u can do it from the desktop. The values are still going to be slightly different on each price on each ladder because with that column you are nominating the price and selection to use to exit. However the stake to be used will be combined so that one bet will balance the P&L for both selections. It will typically be more profitable to exit with the selection with the tightest price increments, but that's not always the case (depending on net stake, book% etc). If you just want to exit based for the maximum profit at that time (and don't want the additional control of selection and price) then just use the green all value in the toolbar..... that will always hunt for the bet that gives maximum profit at the current best market prices. If however, you are seeing wildly different values, then upload a screenshot and we'll have a look. All it takes to activate the feature is to tick the setting on the Green Up page and then find a two selection market. Thanks Peter - each column did have vastly different values yesterday. Will have another look today and send screenshot through to support if necessary. Have tick box selected in settings though. A quick example....not getting same green-up option on 2nd ladder and green up figure should be around £29. If that 'greening bet prevention' option was added we'd need to make it very obvious to the user that the bet had been stopped.... e.g. A popup message that would need to be acknowledged. Otherwise we're going to get support queries along the lines of 'I greened-up but nothing happened'! 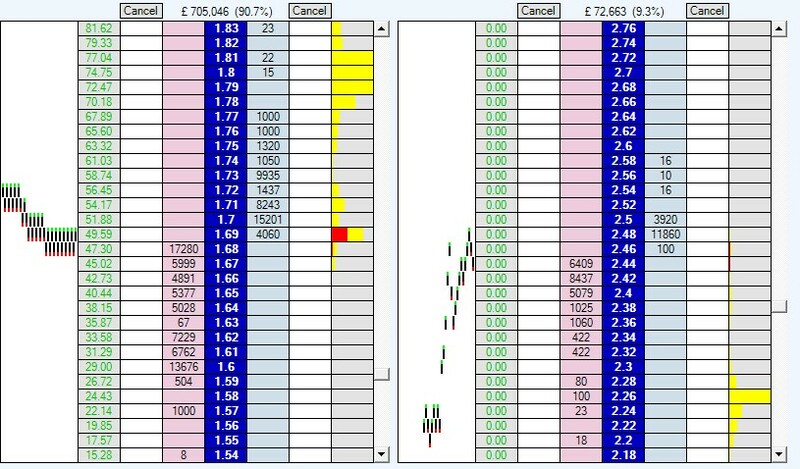 In situations like this, wouldn't you just offer a greening bet somewhere in the middle of the spread using the Trading Profit Column on the ladder? Which market is that? Can we see the P&L & Net stake values in the screenshot also so that we can test the calcs. EDIT: Please check that you have the greening calculation switched on at the top of the Ladder (the green scales in the toolbar), that might explain it because you can't optimise something that isn't switched on. Bingo! Think this was it.